Get the most out of your foam, wool and microfiber buffing pads! The days of cleaning your buffing and polishing pads with a screw driver are over! You don’t neglect the paint you spent countless hours polishing, so why neglect the buffing and polishing pads you used to achieve that flawless finish? Proper car care starts with the right tools and the right chemicals. With the Blackfire Pad Care Kit, you have just that! Give your buffing and polishing pads the same attention you give your vehicle’s delicate finish with the Blackfire Pad Care Kit. Buffing and polishing pads are an investment and when taken care of properly, you can get two to three times the life expectancy from them. The Blackfire Pad Care Kit includes the necessary cleaner, conditioner and pad cleaning brush to achieve the maximum operating life of all your foam, wool and microfiber buffing pads. BLACKFIRE Advanced Pad Cleaner and the Foam Pad Conditioning Brush release caked on polish and wax residue from all types of buffing and polishing pads. BLACKFIRE Advanced Pad Cleaner prolongs the usefulness of your buffing pads by removing product residues. When pads are cleaned thoroughly after every use, they maintain their texture and performance far longer. You'll save money and you'll get better results with your existing pads. Use Blackfire Advanced Pad Cleaner and the Foam Pad Conditioning Brush to clean foam and wool pads after every detail. Blackfire Advanced Pad Cleaner is formulated specifically for the cleaning requirements of buffing pads. Polishes, waxes, and sealants can leave greasy residues inside the pores of foam pads and in the fibers of wool pads. If these residues are not removed, they can affect the performance of the next product applied with the same pad. For example, a pad with old polish residue in it can make the wax applied with the same pad look cloudy. It's not the wax's fault - the pad wasn't clean! 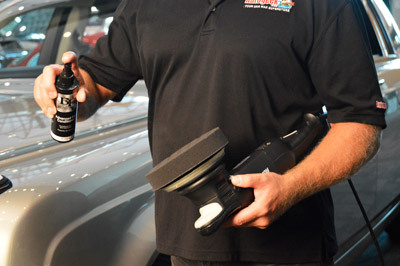 To prevent dry buffing, spray each fresh buffing pad with BLACKFIRE Advanced Pad Conditioner before using it. Dry buffing is what happens when a pad hasn't been primed. There is no lubrication between the pad and the paint to reduce friction. Even though there is polish on the pad, it takes several passes for the polish to completely cover the pad. In the meantime, you're dry buffing the paint! The result is fine scratches. BLACKFIRE Advanced Pad Conditioner prevents dry buffing by moistening the pad face, what we call "priming the pad." It acts as a lubricant to eliminate the friction between the pad and the paint. In addition, BLACKFIRE Advanced Pad Conditioner opens up the foam's pores to accept the polish so it disperses evenly over the pad face. As soon as the pad touches the paint, it is already primed and ready to go! Foam buffing pads become stiff and caked with wax and polish after just one use. If you look closely at the texture of a new foam pad, you’ll see that it is composed of thousands of tiny hollow cells. This varied texture provides polishing action as the pad spins. Wax and polish get caked in these compartments, making the texture of the pad smooth and therefore ineffective. This ergonomically designed Foam Pad Conditioning Brush scrubs wax and polishes out of the foam and restores its original texture. This handy orange brush is made with a set of stiff bristles that easily pull caked and dried products out of the foam pad. And the specially shaped handle makes it comfortable to grip and keeps your hand away from the spinning buffer. When you’re finished with your buffing pads for the day, saturate them with BLACKFIRE Advanced Pad Cleaner and use the Foam Pad Conditioning Brush to break up and release caked on polish and wax residue. With the Blackfire Pad Care Kit you can clean and condition your pads the right way so that you get the most out of your investment. A total retail value of $58.97. You save $13.97!